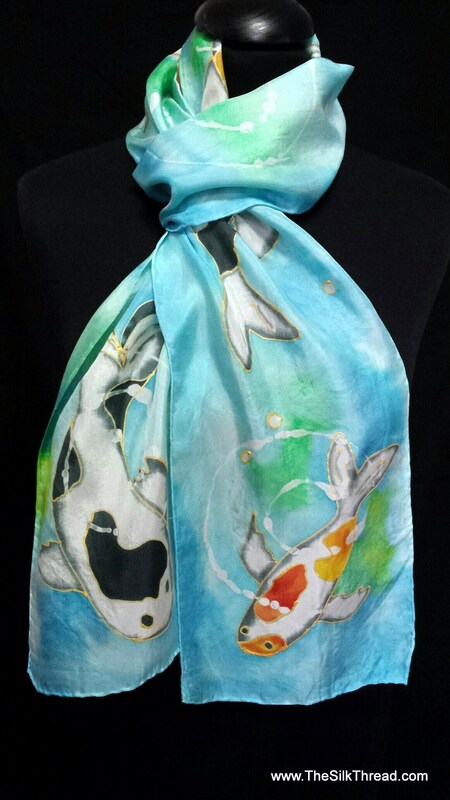 My 8" x 72" pure silk Koi scarf is one of a kind, hand painted and dyed by me. It has my exclusive and hand drawn in gold, Koi or Goldfish swimming in blue waters under white ripples. You won't find mass commercial patterns in my work as each piece is my own! The lovely colors make it a fun, attractive scarf. Soft and silky! This can be worn as a scarf or hung on the wall as a beautiful, original painting! In many of my scarves I either hand draw and dye the designs or I design and carve my own reliefs, build the blocks and print my designs onto the silk. The results are one of a kind designs, beautiful colors and a unique silk scarf. Each piece is designed, hand painted and dyed by me, artist M Theresa Brown. Each of my silk scarves and all designs are unique and everything hand done here in my North Carolina studio. Custom orders accepted! Hand wash in cool water with mild detergent and drip dry. Iron on silk setting as needed with press cloth.